Samsung is soon to introduce a new smartphone in the Galaxy A series. The latest device from Samsung in the Galaxy A series will be called the Samsung Galaxy A2 Core. The Samsung Galaxy A2 Core comes with a 5-inch qHD(960x540p) display on the front. It comes with 1GB of RAM and 16GB of internal storage with support for Micro SD card slot. It is powered by an Octa-Core Samsung Exynos 7870 SoC. 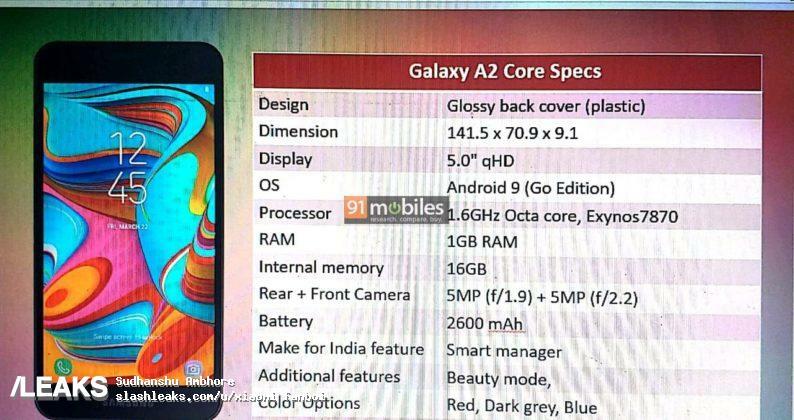 The Samsung Galaxy A2 Core is expected to be available in Red, Blue and Dark Grey color variants. It will be priced at ₹5290 in India.